Over the course of three weeks in late December and early January, a series of storms battered California, Utah, Nevada and Arizona, bringing heavy snowfall in the mountains and torrential rainfall that triggered deadly flooding and mudslides. The bizarre weather was caused by a confluence of systems, one from the frigid north and one from the tropics, made possible by a little known climate cycle. 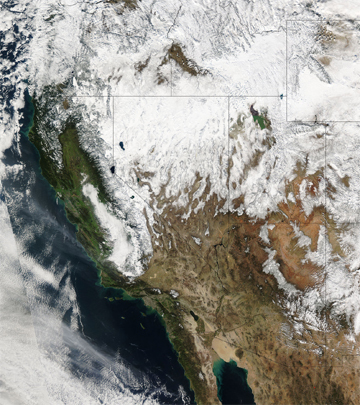 Heavy snow covered most of the western United States on Jan. 12. In the end, almost 20 feet of snow fell in the Sierra Nevada over the course of three weeks in late December and early January. Heavy snow also fell on the mountains of Nevada, Utah and Arizona, as well as in the valleys. NASA image courtesy of the MODIS Rapid Response Team at NASA/GSFC. The weather was quite unusual, says Dan Keeton, meteorologist in charge of the Los Angeles bureau of the National Weather Service, perhaps even freakish. Almost 20 feet of snow fell in the Sierra Nevada, and southern California had more rain than it had seen in any of the past 40 years. In the first 10 days of January, Los Angeles accumulated 15 inches of rain  more than the yearly average. The weather events were responsible for the deaths of 28 people in California and have cost the state an estimated $100 million. Ten of the victims were killed when a rain-saturated hillside collapsed, burying a La Conchita neighborhood under 30 feet of mud that destroyed 13 homes and damaged 18 others. The disaster prompted Gov. Arnold Schwarzenegger to declare a countywide state of emergency. A 1995 landslide in La Conchita, about 60 miles northwest of Los Angeles, damaged 14 houses but caused no deaths. The Pineapple Express was made possible by the Madden-Julian climate oscillation, a rearrangement of the atmosphere that operates on a 30- to 60-day cycle. Named for its discoverers Roland Madden and Paul Julian, who, in 1971, were the first to discern the relationship between heat being emitted from the atmosphere and changes in zonal winds above the tropical Pacific, the oscillation accounts for a large degree of the weather variation in the tropics, something previously thought to be unpredictable. The winter storms followed close on the track of several large storms last fall that also delivered record rain and snowfall to many parts of the West. The Sierra Nevada had already recorded 48 inches of snow in October, when a Thanksgiving storm dropped another 18 inches. The substantial snowpack may prove a boon for much of the western United States, which has been mired in a five-year-long drought. According to the National Oceanic and Atmospheric Administrations Climate Prediction Center, in January, the water content of the snowpack in the Southwest was 150 percent of normal.